Speed, spot kicks, strikers and soggy feet? When you are playing football the last thing you want is to have to lose focus because your feet are cold and wet. These three layer construction, football socks from Sealskinz can help to keep your feet cool and dry, even in to extra time! 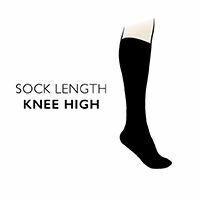 The first layer is a close-fitting coolmax sock which very cleverly draws moisture away from the feet, keeping them dry and cool. The second layer is a water-proof membrane which prevents moisture from getting in. Finally the outer layer is tough and durable giving cushioning to the foot. Dry, cool feet are less likely to blister. Take the pressure off your feet and focus on the win with these Sealskinz football socks. Watch the product video for a demonstration of SealSkinz football socks being put through their paces on the pitch! The footballer in the video is wearing a SealSkinz sock on his right foot and a different branded football sock on his left... see which sock keeps the foot entirely dry during his wet game!